Nashata’s modest performance swimwear is finally here after more than a year working on it. This is very close to my heart as I love swimming and I wanted my sisters to be able to enjoy swimming for performance. My love for swimming started at 10 years old, when my cousins, brother and I went for swimming lessons with Mr. Wong at the Ipoh City Council Swimming Pool Complex. Years after that, while at the university, I continued swimming frequently. I would take time off to lap swim either in between classes or when I get stuck with my projects. I always got out of the pool with a clearer mind. That was also when I started to improve swimming performance. When you are in a pool with swimmers segregated by slow, medium, fast lanes, you just do not want to be in the slow lane. What I thought was fast, wasn’t fast enough. I was wearing conventional swimwear back then and when I started to wear hijab, the only swimwear I could feel good swimming in was a full body suit. This is because the modest swimwear I tried gave me anti-laminar flow and dragging effect. It is unpleasant and difficult to improve swimming performance when there is a drag. 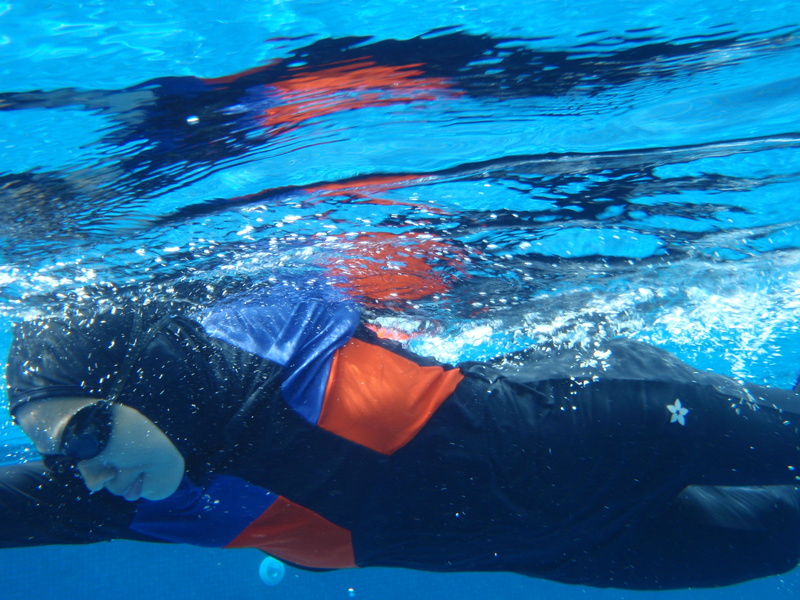 Sarah feels the difference swimming in Nashata’s Sibaha that now she wants to swim even more! 1. Why improving swimming performance is important? Swimming is a good low-impact, full-body exercise. You get to move your full body with little ‘pounding’ on your body as to compared to running and jumping. This reduces risk of injury, especially the joints. As you get older, low-impact exercise like swimming is more gentle on your body. Improves heart and lung function. The rhythm you get into when you swim improves your breathing and lung capacity. Swimming frequently improves endurance. Your body just gets stronger and stronger. It is good for your brains. Repetitive movement like swimming improves blood flow to brain. Perhaps this explains why I always get out of the pool with a clearer mind. However, I was not able to get the same swimming experience in modest swimwear available in the market. I needed a modest performance swimwear that maintains laminar flow and lesser dragging effect so that I could focus to swim faster and longer. Nashata Sibaha for Performance gives freedom to swim swiftly and modestly, so that I can reach my full potential. Together with Ida Bakar, we design and test Nashata Sibaha for performance and introduce key concepts in modest swimwear that are aesthetic and athletic. The concept of our swimwear is to wear Nashata’s body suit and pair it up with Nashata’s Sibaha tops on the outside. 2. Why Nashata’s sleeveless body suit? With the body suit, you need not wear additional sports bra or undies. No bra is required because the body suit is very tight. You can insert removable bra pads provided if you like. For hygienic reason, the body suit comes with built-in crotch lining. 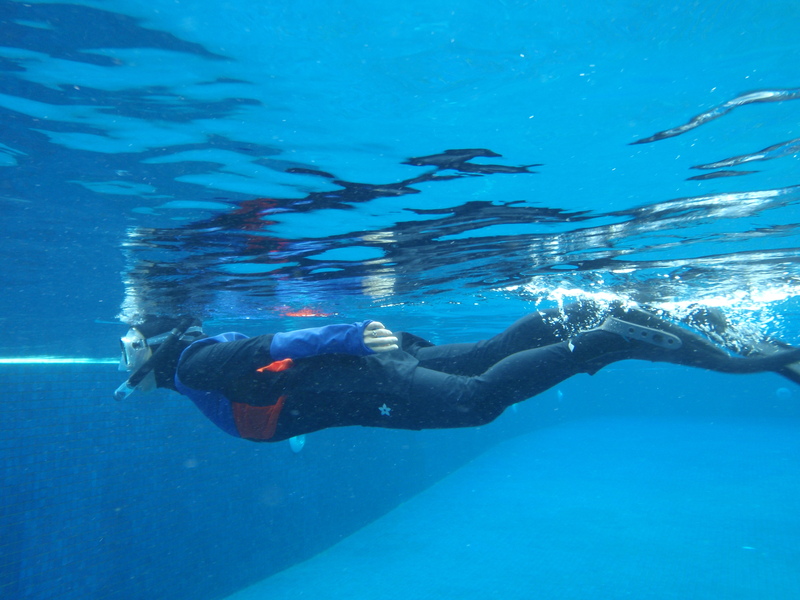 You can swim, turn or dive with a peace of mind in the body suit. Your key body parts are covered & secured at all times! Your top on the outside would slide accordingly to maintain a good laminar flow. No strings or tying up is required and you can just focus on your swim. You get to reduce turbulence flow at different pressure and water condition. 3. What’s so special about Nashata’s Sibaha for Performance? Be it by the pool or in the water, Nashata Sibaha looks just great. Aesthetic color combination that looks good underwater. The colors was tested for diving and under water. 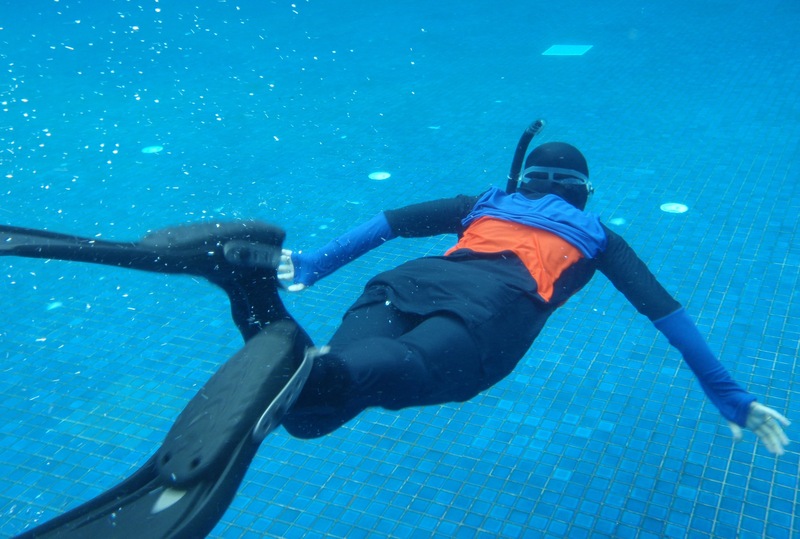 Vest-like design on upper body, making you visible both on the surface and underwater. 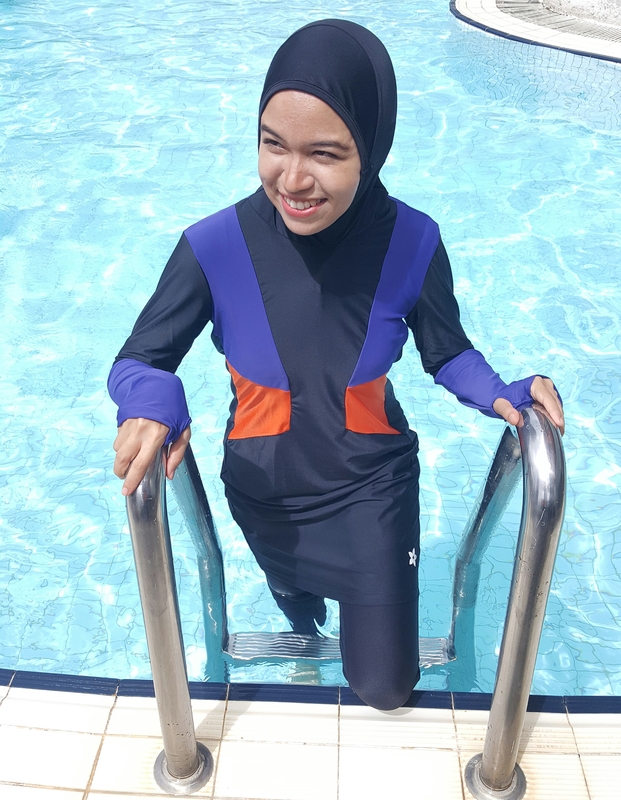 Aqilah loves the seamless design of the hijab and swimming top. Now, you can just keep swimming and enjoy all sorts of formation and performance in the water. Available at nashata.com and we ship internationally for all our sisters. 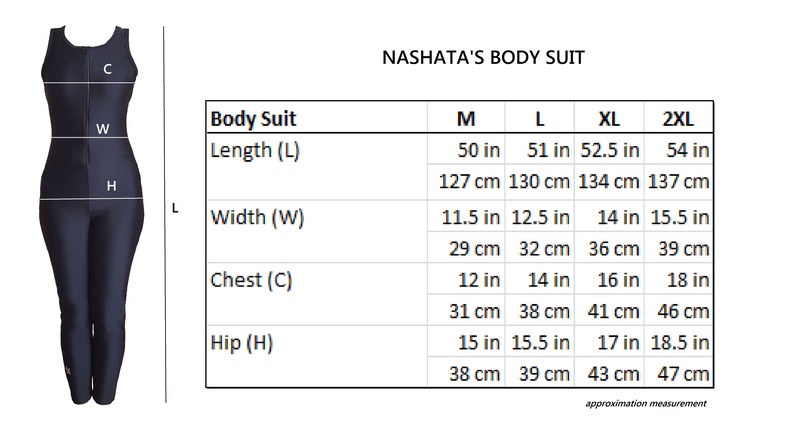 Get RM30 OFF for Nashata Body Suit when you purchase Nashata Sibaha Swimwear. Vouchercode SIBAHA is valid till 28 Nov ’16 only at nashata.com. Not valid for use together with other vouchers or promotions.